Conditional Formatting in Excel can be a great ally in while working with spreadsheets. A trick as simple as the one to highlight every other row in Excel could immensely increase the readability of your data set. And it is as EASY as PIE. Let’s say you want to highlight every second month (i.e., February, April and so on) in this data set. This can easily be achieved using conditional formatting. Select the data set (B4:D15 in this case). Open the Conditional Formatting dialogue box (Home–> Conditional Formatting–> New Rule) [Keyboard Shortcut – Alt + O + D]. 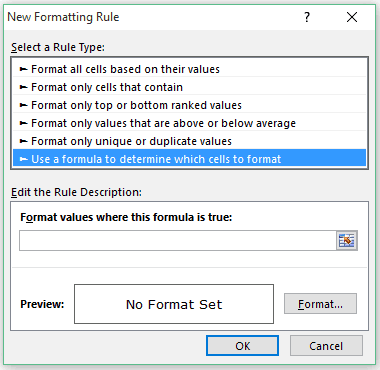 In the dialogue box, click on “Use a Formula to determine which cells to format” option. Click on the Format button to set the formatting. That’s it!! You have the alternate rows highlighted. Now let’s take a step back and understand how this thing works. The entire magic is in the formula =MOD(ROW(),2)=1. 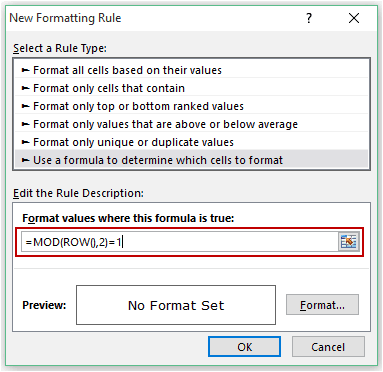 [MOD formula returns the remainder when the ROW number is divided by 2]. This evaluates each cell and checks if it meets the criteria. So it first checks B4. Since the ROW function in B4 would return 4, =MOD(4,2) returns 0, which does not meet our specified criteria. So it moves on to the other cell in next row. Here Row number of cell B5 is 5 and =MOD(5,1) returns 1, which meets the condition. Hence, it highlights this entire row (since all the cells in this row have the same row number). These banded rows are also called zebra lines and are quite helpful in increasing the readability of the data set. If you plan to print this, make sure you use a light shade to highlight the rows so that it is readable. Creating a Heat Map in Excel. How to Apply Conditional Formatting in a Pivot Table in Excel. Conditional Formatting to Create 100% Stacked Bar Chart in Excel. 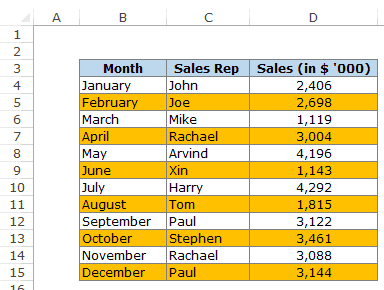 How to Insert Multiple Rows in Excel. How to Count Colored Cells in Excel. How to Highlight Blank Cells in Excel. 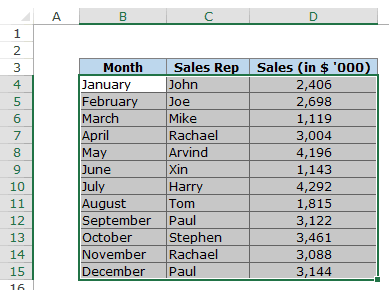 7 Quick & Easy Ways to Number Rows in Excel. How do i find % differences between numbers in two columbs? 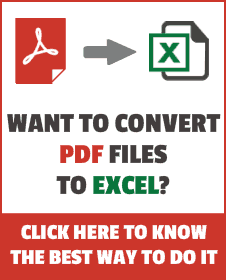 Sir can you suggest / create any a default function in excel which will highlight row & column for every excel workbook by default without any application. This was really helpful. Thank you for sharing. Very Helpful. Thank you for sharing and answering all the questions. This really helped me. How would you highlight every 10th row, starting from 2? is there a formula for 4 rows highlighted, 4 rows not highlighted, and so on? Hi there, how do I highlight/shade/flag every 5th cell along a single row, and only the cells that contain a ‘1’. I have only found formulas highlighting every nth row down a column, and no examples for along a row. Can you help me? I guess you are pasting the formula in the worksheet. 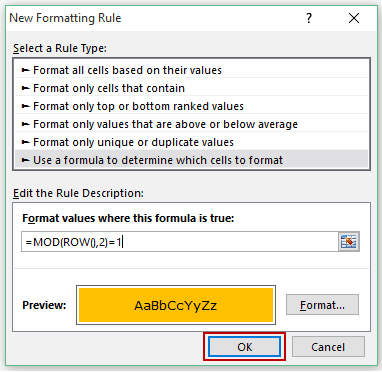 Instead, you need to paste the formula in the conditional formatting box as shown in the article. How do I get this to only highlight cells every fourth row that are great than 1 but less than 99999?